اعلمی, محمدتقی, نورانی, وحید, دانشور وثوقی, فرناز. (1395). استفاده از خوشه‌بندی مکانی برای پیش‌بینی پارامترهای کیفی آب زیرزمینی با مدل انفیس. مجله آب و فاضلاب, 27(3), 62-74. محمدتقی اعلمی; وحید نورانی; فرناز دانشور وثوقی. "استفاده از خوشه‌بندی مکانی برای پیش‌بینی پارامترهای کیفی آب زیرزمینی با مدل انفیس". مجله آب و فاضلاب, 27, 3, 1395, 62-74. اعلمی, محمدتقی, نورانی, وحید, دانشور وثوقی, فرناز. (1395). 'استفاده از خوشه‌بندی مکانی برای پیش‌بینی پارامترهای کیفی آب زیرزمینی با مدل انفیس', مجله آب و فاضلاب, 27(3), pp. 62-74. اعلمی, محمدتقی, نورانی, وحید, دانشور وثوقی, فرناز. استفاده از خوشه‌بندی مکانی برای پیش‌بینی پارامترهای کیفی آب زیرزمینی با مدل انفیس. مجله آب و فاضلاب, 1395; 27(3): 62-74. مدل‌سازی پارامترهای کیفی آب‌های زیرزمینی به‌عنوان یکی از منابع تأمین آب شهری، کشاورزی و صنعتی بسیار حائز اهمیت است. همراه با توسعه استفاده از روش‌های نوین مدل‌سازی در سال‌های اخیر، استفاده از ابزارهای پیش‌پردازش زمانی و مکانی داده‌ها در بالا بردن دقت این روش‌ها اهمیت زیادی یافته است. در پژوهش حاضر از ابزارهای زمین آمار یا کوکریجینگ و نقشه‌های خود سازمانده به‌ترتیب به‌عنوان تخمین‌گر مکانی و خوشه‌بندی در ترکیب با مدل شبکه عصبی- فازی انفیس برای پیش‌بینی زمانی پارامترهای کیفی هدایت الکتریکی و مقدار کل جامدات محلول در آب زیرزمینی دشت اردبیل استفاده شد. همچنین در این مطالعه، اثر خوشه‌بندی مکانی در پیش‌بینی زمانی هدایت الکتریکی و مقدار کل جامدات محلول بررسی شد. نتایج نشان داد که خوشه‌بندی مکانی با انتخاب ورودی‌های مؤثر، روش مناسبی در جهت بهبود پیش‌بینی پارامترهای کیفی آب زیرزمینی با استفاده از مدل انفیس است. Groundwater is a major source of water supply for domestic, agricultural, and industrial uses; hence, its quality modeling is an important task in hydro-environmental studies. While many data-based models have been developed for this purpose, the performance of such data-based models can be drastically enhanced if they are based on temporal and spatial pre-processing. In this study, geostatistics tools (e.g., Co-Kriging), as spatial estimators, and self-organizing map (SOM), as a clustering technique, were employed in conjunction with Adaptive Neuro-Fuzzy Inference System (ANFIS) for the temporal forecasting of such quality parameters as electrical conductivity (EC) and total dissolved solids (TDS) of the groundwater in Ardabil Plain. Using the results thus obtained, the impact of spatial data clustering was also investigated on the same parameters. The results showed that, if propoer input data are selected, the proposed spatial clustering technique is capable of imporving groundwater quality forecasts made by ANFIS. 1. Nourani, V., Monadjemi, P., and Singh, V. P. (2007). “Liquid analog model for laboratory simulation of rainfall-runoff process.” J. Hydrol. Eng., 12(3), 246-255. 2. Hsu, K., Gupta, H. V., and Sorooshian, S. (1995). “Artifical neural network modeling of the rainfall-runoff process.” J. Hydrol., 31(10), 2517-2330. 3. Ma, T.S., Sophocleous, M., and Yu, Y.S. (1999). “Geostatistical applications in groundwater modeling in South-central Kansas.” J. Hydrol. Eng., 4(1), 57-64. 4. Mouser, D., and Rizzo., P. (2000). “Evaluation of geostatistics for combined hydrochemistry and microbial community fingerprinting at a waste disposal site.” Critical Trasntions in Water and Environmental Resourcess Management, doi: 10.1061/40737 (2004) 106. 5. Gaus, I., Kinniburgh, D.G., Talbot, J.C., and Webster, R. (2003). “Geostatistical analysis of arsenic concentration in groundwater in Bangladesh using disjunctive kriging.” Environ. Geo., 44, 939-948. 6. Barca, E., and Passarella, G. (2008). “Spatial evaluation of the risk of groundwater quality degradation. A comparison between disjunctive kriging and geostatistical simulation.” Environ. Monit. and Assess, 137, 261-273. 7. Taghizadeh Mehrjardi, R., Zareian Jahromi, M., Mahmodi, S., and Heidari, A. (2008). “Spatial distribution of groundwater quality with geostatistics (case study: Yazd-Ardakan plain).” World Appl. Sci. J., 4(1), 9-17. 8. Samin, M., Soltani, J., Zeraatcar, Z., Moasheri, A., and Sarani, N. (2012). “Spatial estimation of groundwater quality parameters based on water salinity data using Kriging and Cokriging Methods.” International Conference on Transport, Environment and Civil Engineering (ICTECE'2012), Kuala Lumpur, Malaysia. 9. 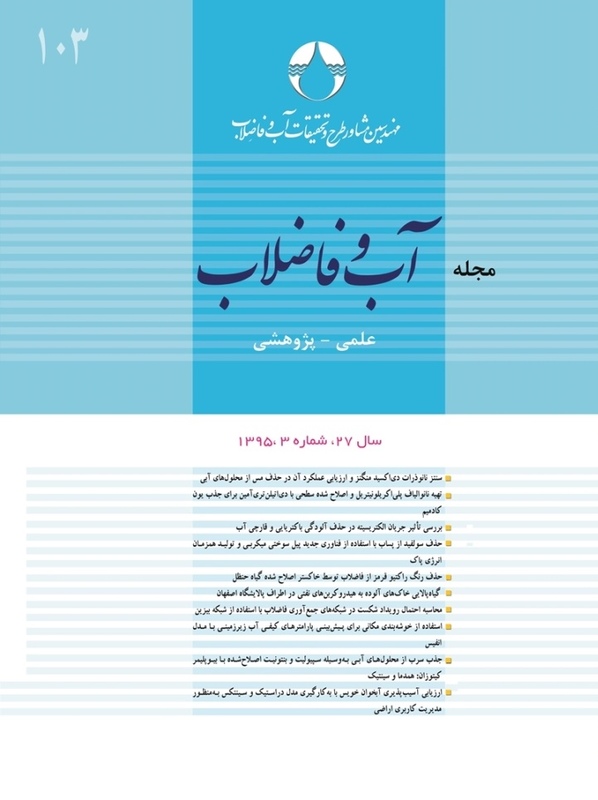 Ahmadian, S. (2013). “Geostatistical based modelling of variations of groundwater quality during 2006 to 2009 (in Tehran-Karaj Plain).” J. Basic Appl. Sci. Res., 3(2), 264-272. 10. Taheri Tizro, A, Voudouris, K., and Vahedi, S. (2014). “Spatial variation of groundwater quality parameters: A case study from a semiarid region of Iran.” Int. B. Water Resour. Develop., 1(3), 1-11. 11. Mousavifazl, H., Alizadh, A., and Ghahraman, B. (2013). “Application of geostatistical methods for determining nitrate concentrations in groundwater (case study of Mashhad plain, Iran).” Int. J. Agri. Crop Sci., 5(4), 318-328. 12. Delbari, M., Bahraini Motlagh, M., Kiani, M., and Amiri, M. (2013). “Investigating spatio-temporal variability of groundwater quality parameters using geostatistics and GIS.” Intl. Res. J. Appl. Basic. Sci., 4(10), 3623-3632. 13. Taghizadeh-Mehrjardi, R. (2014). “Mapping the spatial variability of groundwater quality in Urmia, Iran.” J. Mater. Environ. Sci., 5(2), 530-539. 14. Peeters, L., and Dassargues, A. (2006). “Classification of groundwater samples in wetlands using self-organizing maps.” International Association for Mathematical Geology 6th International Congress, Belgium. 3-8. 15. Snchez-Martos, F., Aguilera, P.A., Garrido-Frenich, A., Torres, J., and Pulido-Bosch, A. (2002). “Assessment of groundwater quality by means of self-organizing maps: Application in a semiarid area.” Environ. Manage., 30(5), 716-726. 16. Hong, Y-S., and Rosen, M.R. (2001). “Intelligent characterization and diagnosis of groundwater quality in an urban fractured-rock aquifer using an artificial neural network.” Urban Water, 3, 193-204. 17. Peeters, L., Bacao, F., Lobo, V., and Dassargues, A. (2007). “Exploratory data analysis and clustering of multivariate spatial hydrogeological data by means of GEO3DSOM, a variant of Kohonen’s self-organizing map.” Hydrol. Earth Sys. Sci., 11, 1309-1321. 18. Choi, B.Y., Yun, S.T., Kim, K.H., Kim, J.W., Kim, H.M., and Koh, Y.K. (2014). “Hydrogeochemical interpretation of South Korean groundwater monitoring data using self-organizing maps.” J. Geochem. Explor., 137, 73-84. 19. Nguyen, T.T., Kawamura, A., Tong, T.N., Nakagawa, N., Amaguchi, H., and Gilbuena, R. (2015). “Clustering spatio–seasonal hydrogeochemical data using self-organizing maps for groundwater quality assessment in the Red River Delta, Vietnam.” J. Hydro., 522, 661-673. 20. Maier, H.R., and Dandy, G.C. (1996). “The use of artificial neural networks for the prediction of water quality parameters.” Water Resour. Res., 32 (4), 1013-1022. 21. Lin, G.F., and Chen, G.R. (2005a). “Determination of aquifer parameters using radial basis function network approach.” J. Chinese Inst. Engineers, 28 (2), 241-249. 22. Lin, G.F., and Chen, L.H. (2005b). “Time series forecasting by combining the radial basis function network and the self-organizing map.” Hydrol. Process, 19 (10), 1925-1937. 23. Lin, G.F., and Chen, G.R. (2006). “An improved neural network approach to the determination of aquifer parameters.” J. Hydrol., 316 (1-4), 281-289. 24. Banerjee, P., Singh, V.S., Chatttopadhyay, K., Chandra, P.C., and Singh, B. (2011). “Artificial neural network model as a potential alternative for groundwater salinity forecasting.” J. Hydrol., 398, 212-220. 25. Orzepowski, W., Paruch, A.M., Pulikowski, K., Kowalczyk, T., and Pokładek, R. (2014). “Quantitative and qualitative assessment of agricultural water resources under variable climatic conditions of Silesian Lowlands (Southwest Poland).” Agric. Water Manage, 138, 45-54. 26. Mousavi, F., and Amiri, M. J. (2012). “Modelling nitrate concentration of groundwater using adaptive neural-based fuzzy inference system.” Soil Water Resour., 7(2), 73-83. 27. Kisi, O., and Ay, M. (2012). “Modelling COD concentration by using three different ANFIS techniques.” Sixteenth International Water Technology Conference, Istanbul, Turkey, IWTC-16. 28. Tutmez, B., Hatipoglu, Z., and Kaymak, U. (2006). “Modelling electrical conductivity of groundwater using an adaptive neuro-fuzzy inference system.” Comput. Geosci., 32, 421-433. 29. Aqil, M., Kita, I., Yano, A., and Nishiyama, S. (2007). “Analysis and prediction of flow from local source in a river basin using a Neuro–fuzzy modeling tool.” J. Environ. Manage, 85, 215-223. 30. Jang, J.S.R., Sun, C.T., and Mizutani, E. (1997). Neuro–fuzzy and soft computing: A computational approach to learning and machine intelligence, 3rd Ed., Prentice Hall, New Jersey. 32. Kohonen, T. (1998). “The self-organizing map.” Neurocomputing, 21, 1-6. 33. Hsu, K., and Li, S. (2010). “Clustering spatial–temporal precipitation data using wavelet transform and self-organizing map neural network.” Adv. Water Resour., 33, 190-200. 34. Myers, D.E. (1982). “Matrix formulation of cokriging.” Math. Geol., 14, 249-257.